Sorry I seem to be sporadic with my post lately.. I've been working on a custom order and prepping for a card class I had yesterday most of the weekend.. It was a small class, but I seem to be struggling with coming up with new ideas lately or ones that can be done in a class anyways. 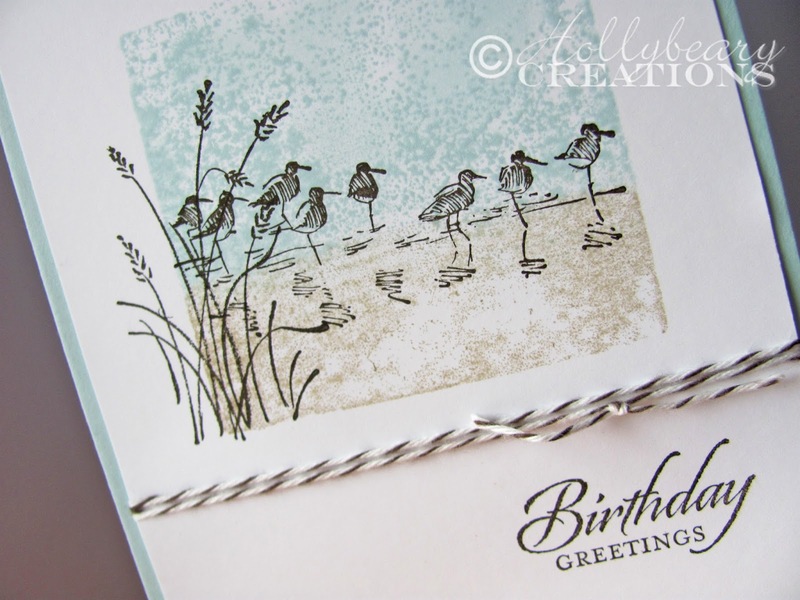 My card base is Soft Sky with a layer of Whisper White. Using the clear stamp block "D" I inked up 3/4 of it with the Soft Sky Ink Pad and then the other part with Crumb Cake. Huff'd on the block and stamped it down onto the White piece. It was a little splotchy but I liked how it looked.. You could sponge on some more ink if you wanted. 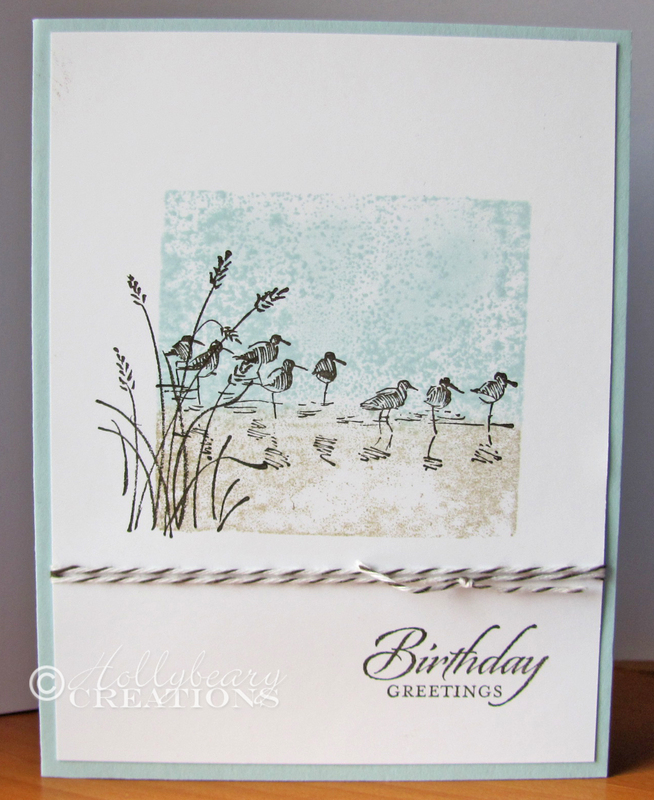 Then using Early Espresso Ink I stamped the Birds from the "Wetlands" Set and then the grass from the same set. I stamped the sentiment from the same set in Early Espresso as well and then I added some Early espresso Bakers Twine and added the White Layer to the Soft Sky base. This is a great Masculine card and you could change up the Sentiment for any occasion. I'm glad I didn't follow the links to see how they created their cards.. I really like the way this came out with the Block stamped as the background! 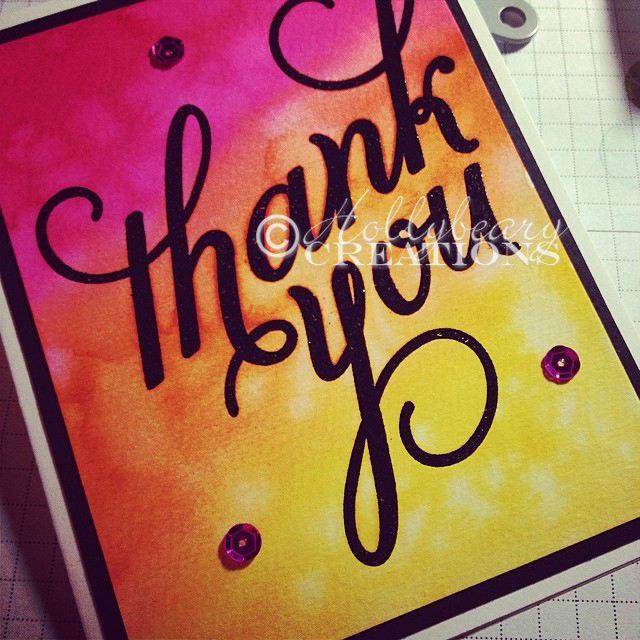 I also created a Beautiful Watercolor Thank You card but I didn't get a great picture of it before I gave it away... Here's a picture I posted in Instagram after I finished it. Hope you are having a great day... Thanks for stopping by!